We decided to go ahead and do a SUPER PACKED seed bundle for all the HOT heads out there!! 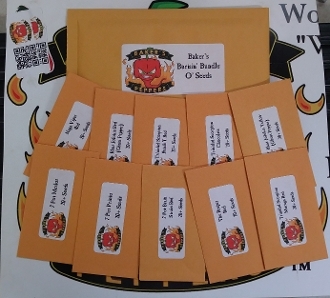 In this bundle you will get 10 types of seeds individually packed by type!! Thats right! There will be 10 types included in each order! Each type will be labeled for ease of I.D. and there will be 20+ seeds of each type! Get this bundle of ALL NUKES TODAY!!! If purchased seperately it would total OVER $55!! Order yours for next season TODAY!